Instant downloads of all 942 LitChart PDFs (including Roman Fever). 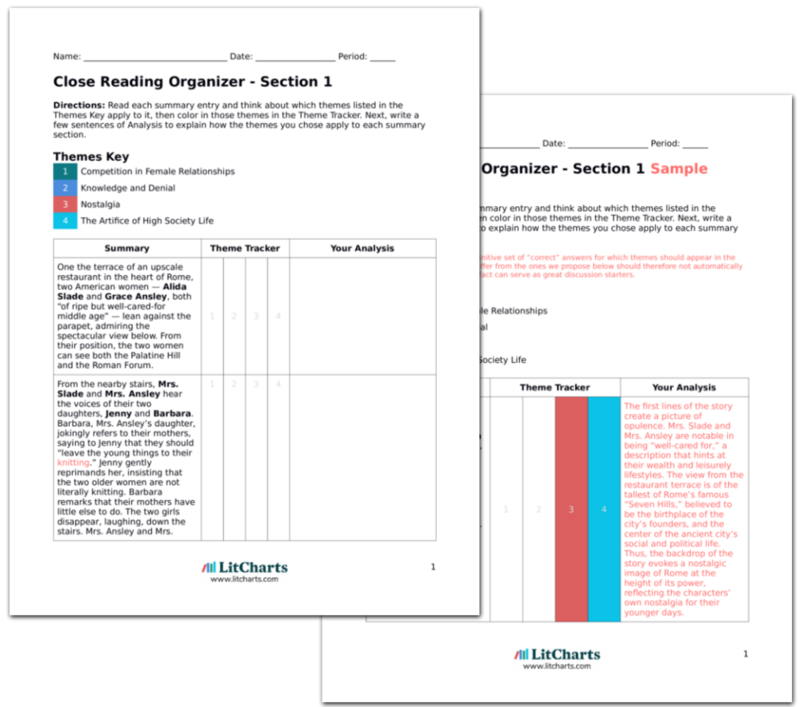 LitCharts assigns a color and icon to each theme in Roman Fever, which you can use to track the themes throughout the work. On the surface, it seems as though Mrs. Ansley’s revelation at the end of the afternoon—that she had an affair with Delphin and became pregnant with Barbara as a result—upends everything Mrs. Slade believes about her marriage, her friendship with Mrs. Ansley, and herself. However, closer investigation suggests that hearing Mrs. Ansley’s version of events does not change Mrs. Slade’s fundamental understanding of her friend as a threat; rather, it strips away a fiction to which Mrs. Slade has clung for years, and confirms the troubling truths she has suspected—and suppressed—since her youth. Although she disparages Mrs. Ansley in her thoughts throughout the afternoon, Mrs. Slade admits that she has always been aware of and threatened by her friend’s subtle power. In a sudden moment of truthfulness, she tells Mrs. Ansley: “I was afraid; afraid of you, your quiet ways, your sweetness … your … well, I wanted you out of the way, that’s all.” Despite this understanding, Mrs. Slade’s powers of self-deception are powerful. She does not recognize—at least, not until Mrs. Ansley tells her explicitly—the depth and authenticity of Mrs. Ansley’s feelings for Delphin, or the ways in which their attraction to one another shaped her life. The tension between knowledge and denial extends beyond Mrs. Slade’s understanding of her marriage and her friendship with Mrs. Ansley. Mrs. Slade admits she has a taste for drama. She misses the fast-paced life she shared with Delphin and seems unduly frustrated at the absence of scandal and adventure in the life of her daughter, Jenny, as if desiring a distraction from the sorrows and struggles of her life as a widow. Her desire for Jenny to “fall in love—with the wrong man, even” seems inextricably intertwined with the sadness and uneventfulness of her widowhood. She longs to live vicariously through her daughter so that she can avoid confronting her own loneliness and sorrow after having lost a partner. In addition to the difficult but expected death of her husband, however, is a profound tragedy that Mrs. Slade acknowledges only briefly: she refers, in her thoughts, to the “agony” of losing her son, who “died suddenly in boyhood” a number of years before the beginning of the story. Mrs. Slade observes how the grief she feels at losing her husband amplifies the grief she feels when she returns to the memory of her son: “after the father’s death, the thought of the boy had become unbearable.” In large and small ways, Mrs. Slade’s thoughts and behavior suggest that she is desperate to avoid confronting the painful realities of her life. The ThemeTracker below shows where, and to what degree, the theme of Knowledge and Denial appears in each section of Roman Fever. Click or tap on any chapter to read its Summary & Analysis. 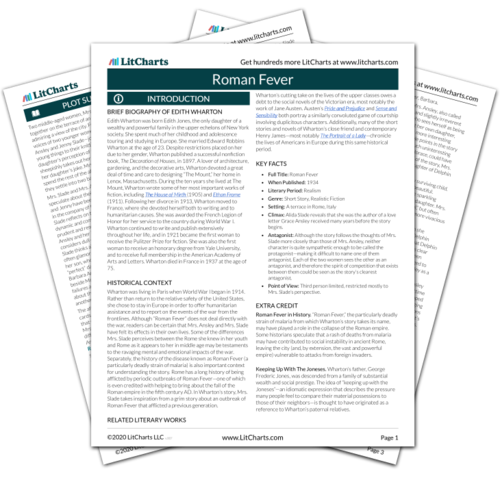 Get the entire Roman Fever LitChart as a printable PDF. Below you will find the important quotes in Roman Fever related to the theme of Knowledge and Denial. “It always will be, to me,” assented her friend Mrs. Ansley, with so slight a stress on the “me” that Mrs. Slade, though she noticed it, wondered if it were not merely accidental, like the random underlinings of old-fashioned letter-writers. “Grace Ansley was always old-fashioned,” she thought. Unlock explanations and citation info for this and every other Roman Fever quote. In living up to such a husband all her faculties had been engaged; now she had only her daughter to live up to, for the son who seemed to have inherited his father’s gifts had died suddenly in boyhood. She had fought through that agony because her husband was there, to be helped and to help; now, after the father’s death, the thought of the boy had become unbearable. There was nothing left but to mother her daughter; and dear Jenny was such a perfect daughter that she needed no excessive mothering … She wished that Jenny would fall in love—with the wrong man, even; that she might have to be watched, out-manoeuvred, rescued. Mrs. Ansley had resumed her knitting. One might almost have imagined (if one had known her less well, Mrs. Slade reflected) that, for her also, too many memories rose from the lengthening shadows of those august ruins. But no; she was simply absorbed in her work. Mrs. Ansley was again silent. At length she turned toward the door of the terrace. She took a step, and turned back, facing her companion. “I had Barbara,” she said, and began to move ahead of Mrs. Slade toward the stairway. Jensen, Carlee. "Roman Fever Themes: Knowledge and Denial." LitCharts. LitCharts LLC, 7 Nov 2017. Web. 18 Apr 2019. Jensen, Carlee. "Roman Fever Themes: Knowledge and Denial." LitCharts LLC, November 7, 2017. Retrieved April 18, 2019. https://www.litcharts.com/lit/roman-fever/themes/knowledge-and-denial.